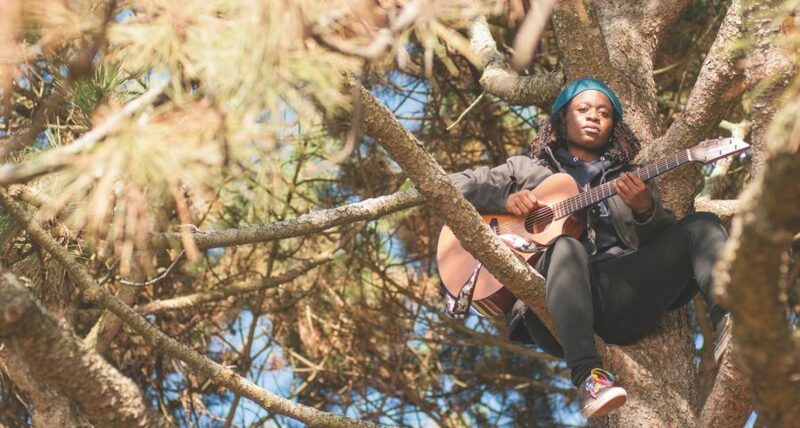 Most people would be happy just to have two full albums under their belt by the time they turned 21; that wasn’t good enough for Medill junior Debbie-Marie Brown. We sat down with her to hear more about her new EP, “Not Too Fast,” which drops early winter quarter on Spotify, Apple Music and YouTube. The Daily: This is the third project you’ve recorded since you got to NU. How has your sound evolved and what makes this EP different? Brown: I feel like each EP is just me learning how to use music better. The first album is all acoustic guitar. The second album is full band and electric guitar, with some acoustic here and there. For this EP, it’s full acoustic band. I have a lot of different harmonies and voices throughout. I would consider it my most mature project — probably the cleanest sound I’ve been able to get out. The tracks are pretty slow and have sort of a “sit back and watch the traffic pass by in the car” vibe. The name is really supposed to embody that. The Daily: Where did your inspiration for this EP come from? Brown: I say my inspiration always comes from the same places, which is me just working through whatever I’m working through at the time. (For this EP), it was about me allowing myself to be patient with myself. That same energy of the EP is the energy I’ve adapted into my life: patience, maturity and accepting things you can’t change. The Daily: When did you start playing music? Brown: I came from a school district back home that really emphasized the arts and musical education. My parents were really good at encouraging and supporting my interests. I started playing guitar in sixth grade, and then played jazz guitar in jazz band in high school. I grew up an orchestra kid, but marching band was a lot cooler at my high school. So, when junior year came around, I was friends with all these band kids and I was like, “I want to join marching band.” I taught myself clarinet that summer, marched my senior year, and then joined NU’s marching band when I got here. I love music. The Daily: You’ve grown up as a musician; how do you think that background shapes your songwriting? Brown: I grew up around a bunch of instruments from worshipping in church, so that’s made me familiar with what kind of sound I want coming from a keyboard or a bass. In my album “Armageddon,” those drums parts were written by me, Gibran (Wirjawan), and Eric Van Camp all together. I told them the intent. I also wrote all the guitar parts. For my new EP, even though I’m not the one who’s playing on the bass, I wrote the bass parts. I told my drummer the kind of sound I wanted and he knew where to hit to get that sound. I’m definitely like a director in the sounds that come out. The Daily: How do you balance school and music? Brown: It’s less of a “How do you make time for it?” and more of a “The only reason I survive at this school is because I have this.” Everything that I do successfully, in terms of expressing myself or expressing an idea is because I have music and it helps me to understand myself. The more compassion I have more myself, the more I can have for other people.